The Mediterranean Sea lapping at the edges of Beirut, Lebanon, is placid as a lake. The sunlight dances on the waters and, as dusk falls, the sky lights up in blazing orange and blood red. The Bay Rock Café on the Corniche is from where to watch the sun go down. Seated in the glazed veranda of the cafe, one can marvel at the rapidly changing colours on the horizon. The cafe thoughtfully provides customers with blankets in which to wrap themselves against the cold wind gusting through the open windows. Down below rise rocks, straight from the sea, twisted into fantastic shapes to fascinate the untutored eye. Immediately behind the city, the hills rise to the cedar forests and cypress trees of the Chouf. Breathtakingly beautiful. Beirut till the 1970s was the Paris of the Middle East, but it came apart in the 18-year-long civil war. The centre of the city was totally destroyed, but has now been entirely rebuilt with such modern and postmodern architectural design as to look more like Manhattan than the proverbial Arab street. There is not a single known world brand that is not on ostentatious display, and the numberless high-end restaurants reflect both the acme of good living and the very high cost of living. One wonders at how the detritus of decades of internecine conflict can afford any of this until one learns that while there are only four million Lebanese living in Lebanon, the Lebanese diaspora is estimated at 17 million. It is remittances from this entrepreneurial and prosperous diaspora that keep Lebanon’s economy humming despite vicious fratricidal strife, proxy wars fought on its blood-stained soil, heartless external aggression, particularly from Israel, and endless streams of refugees, principally now from Syria in addition to untold numbers from Palestine. 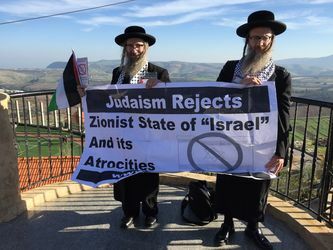 Jews against Israel: Yisroel Dovid Weiss and a fellow Rabbi with an anti-Israel banner. Of the thousand or so delegates at the Global Conference of Solidarity with Palestine that I am here to attend, three stand out in particular. One is the Grand Mufti of Palestine who declares that liberated Palestine will be home not only to Arab Muslims but Christians as well, and even non-Zionist Jews. The second is a man born in Israel, but who rejected its militarism, preferring to live in exile in England rather than accept compulsory military service. He describes himself as a “Hebrew-speaking Palestinian”. The most colourful of all is rabbi Yisroel Dovid Weiss, a pious, practising Jew with long unkempt beard and braided hair. He looks resplendent in his rabbi robes, but has an Arafat scarf around his neck. A button on his dress proclaims: “A Jew, but not a Zionist.” The holy Torah is a constant in his hands, and he represents a US-based organisation that styles itself “Jews against Zionism”. At the border of Lebanon and Israel (or, rather, “Occupied Palestine” as the global conference prefers to more accurately name it), he and his fellow rabbi unfurled a banner proclaiming, “Judaism Rejects Zionist State of ‘Israel’ and its Atrocities!” My quoting Mahatma Gandhi, “Palestine belongs to the Arabs as England to the English and France to the French,” goes down great. The Americans have put Lebanon on the no-go list for fear of kidnapping or assassination. True, the Lebanese loathe the US, above all Donald Trump and his decision to move the embassy to Jerusalem. The Lebanese president launched a broadside against the Americans, when a conference delegation paid a courtesy call on him. But, Indians need not be deterred. On the contrary—and thanks primarily to Shammi Kapoor and his, “Ai Ai Ya karoon mein kya, shukku shukku”—many Lebanese, on learning we are from India, call out in the only Hindi/Urdu they know, “Hindustan zindabad; Pakistan murdabad!” The bullets and grenades are reserved for the Americans and the Israelis. So, why not Beirut, dear reader, for your next holiday?